After you enter the customer and vendor balances into QuickBooks 2016, you need to enter the rest of the trial balance, which you do by taking two big steps. In the first step, you camouflage a couple of goofy accounts, called suspense accounts, which QuickBooks creates when you set up the Item, Customer, and Vendor lists. Here is a sample trial balance after you enter the inventory, accounts receivable, and accounts payable balances. When you set up your Item, Customer, and Vendor lists, you also create account balances for inventory, accounts receivable, and accounts payable. You can produce your own half-complete trial balance from inside QuickBooks by clicking the Report Center icon and choosing Reports → Accountants & Taxes → Trial Balance. QuickBooks displays the trial balance report in a document window. If you need to do so, enter the conversion date in the As Of box by clicking in the box and typing the conversion date in MM/DD/YYYY format. You can set the From box to any value; the From and To range just needs to end with the conversion date. Make a note of the credit and debit balances shown for the Uncategorized Income and Uncategorized Expenses accounts. If you want, you can print the report by clicking the Print button; then, when QuickBooks displays the Print Report dialog box, click its Print button. From the Home screen, either click the Chart of Accounts icon in the Company area or choose Lists → Chart of Accounts to display the Chart of Accounts window. 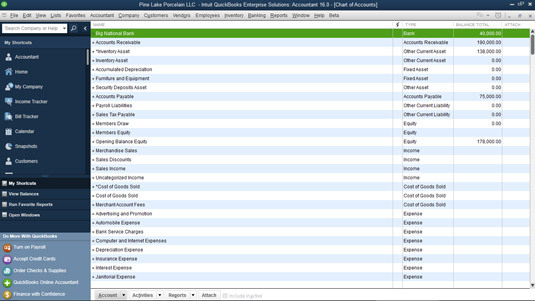 Double-click Opening Balance Equity in the Chart of Accounts list to display that account. Opening Balance Equity is listed after the liability accounts. 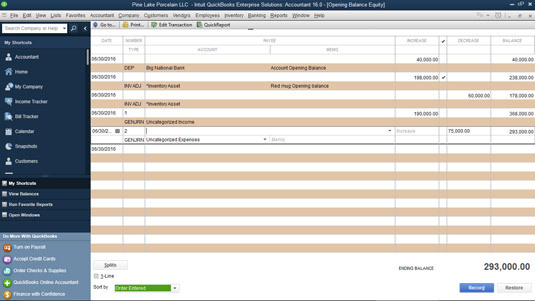 QuickBooks displays the register — just a list of transactions — for the Opening Balance Equity account. Note that your version of the Opening Balance Equity register will look different because it’ll have different transactions. Select the next empty row of the register if it isn’t already selected. You can select a row by clicking it, or you can use the up- or down-arrow key to move to the next empty row. Type the conversion date in the Date field. Move the cursor to the Date field, and type the date. Use the MM/DD/YYYY format. For example, you can type either 06302016 or 6/30/2016 to enter June 30, 2016. Type the Uncategorized Income account balance (from the trial balance report) in the Increase field. In the example above, the Uncategorized Income account balance is $190,000. In this case, click the Increase field and type 190000 in the field. You don’t need to include the dollar sign or the comma; QuickBooks adds the symbol and punctuation for you. Type Uncategorized Income (the account name) in the Account field. Select the Account field, which is on the row under the word Payee, and begin typing Uncategorized Income, the account name. As soon as you type enough of the name for QuickBooks to figure out what you’re typing, it fills in the rest of the name for you. When this happens, you can stop typing. Click the Record button to record the Uncategorized Income adjustment transaction. Again, select the next empty row of the register. Click the row or use the up- or down-arrow key. Move the cursor to the Date field and type the date. You use the MM/DD/YYYY format. You can type 6/30/2016, for example, to enter June 30, 2016. Type the Uncategorized Expenses account balance in the Decrease field. In the example above, the Uncategorized Expenses account balance is $75,000. In this case, you click the Decrease field and then type 75000. Type Uncategorized Expenses (the account name) in the Account field. Select the Account field, which is on the second line of the register transaction, and begin typing Uncategorized Expenses, the account name. As soon as you type enough of the name for QuickBooks to figure out what you’re typing, it fills in the rest of the name for you. Click the Record button to record the Uncategorized Expenses adjustment transaction. Here, you see the Opening Balance Equity register with the correction transactions. The correction transactions are numbered with a 1 and a 2. See them? They’re the fourth and fifth transactions in the register. The last two transactions labeled GENJRN fix the Uncategorized Income and Uncategorized Expenses account balances. You can close the Opening Balance Equity register at this point. You’re finished with it. One way to close it is to click the Close button in the upper-right corner of the window. You can check your work thus far by producing another copy of the trial balance report. What you want to check are the Uncategorized Income and Uncategorized Expenses account balances. They should both be zero. You can produce a trial balance by choosing Reports → Accountant & Taxes → Trial Balance. 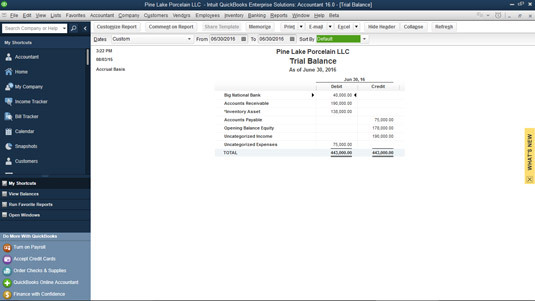 QuickBooks displays the trial balance report in a document window. If you need to enter the conversion date in the As Of line, click the box and type the conversion date in MM/DD/YYYY format. If the Uncategorized Income and the Uncategorized Expenses account balances don’t show zero, you might have botched the accrual adjustment. To fix the mistake, redisplay the Opening Balance Equity register, select the adjustment transactions, and then check the account, amount, and field. If one of the fields is wrong, select the field and replace its contents by typing over it. One other point. You don’t need to worry about any other accounts you see in the example. You only need to make sure that the Uncategorized Income and Uncategorized Expense account balances equal zero after your adjustments.